Karina's Kreations: SAB 2015 Big Day Sneak Peak! SAB 2015 Big Day Sneak Peak! 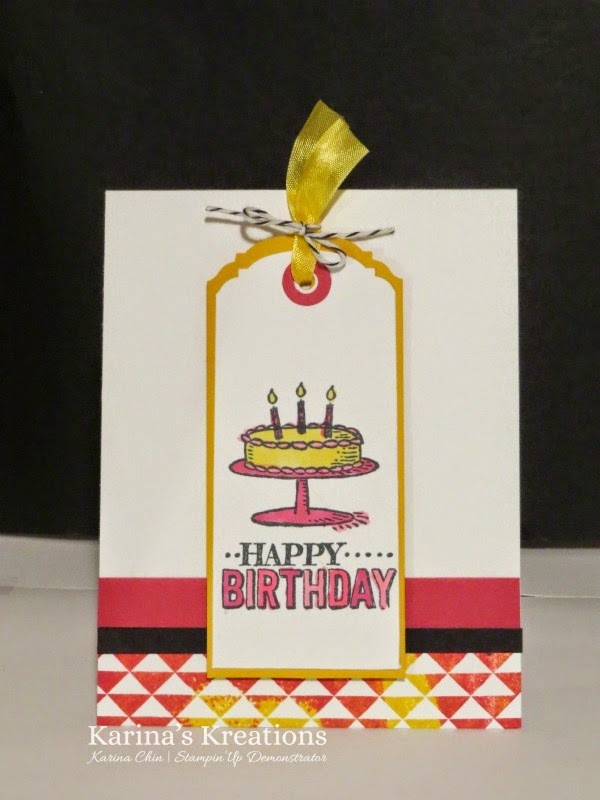 Over the next week, I'll show you some sneak peaks of Sale-a-bration cards and cards from the new Occasions catalog. I hope you enjoy them. Today's card uses the Sale-a-bration stamp set Big Day! This stamp set has fun birthday images and greetings. You can get this stamp set free with a $60.00 order starting Jan 6th! The image was colored with Melon Mambo and Daffodil Delight Blendabilities markers which can be ordered or earned for free with a $60.00 order. Notice the new tag topper punch? It's cute!